TV: Bright House Sports Network (Central Florida/Tampa Bay), Channel 47, HD 1147 – LIVE; Cox Sports Television (Gainesville/Ocala & Panhandle) – Check local listings for channel – LIVE | No word as of this time if the game will be available to Comcast subscribers in most other Florida markets. Victory Christian has been riding high on its offensive and defensive production the entire season. The Storm, which won the District 2A-4 championship for the second year in a row, easily dominated St. Edward’s of Vero Beach in the regional semifinals, winning 49-0. In the regional finals, Victory Christian, saw the toughest fight they likely faced since playing Berkeley Prep in the season when Warner Christian came to town. The Storm went on to defeat the Eagles, 41-34. The next pair of Eagles came in last week from Tallahassee as North Florida Christian came in and didn’t put up the expected fight with Victory Christian winning the game, 51-22. This is Victory Christian’s second straight appearance in a state final. Like we have said, Victory Christian has relied on a solid effort from both sides of the ball this season. Senior quarterback Caleb Lewis has thrown for 2,229 yards so far this season, completing 136 passes out of 248 attempts. Lewis has only seen 7 passes get intercept during the seaso and has thrown for 26 touchdowns. Lewis’ primary target on the field will be senior wide receiver Alvin Harper, Jr. Harper has already had a big season for the Storm, having 1,208 yards receiving on 61 receptions and 15 touchdowns. The rushing attack for Victory Christian also lends a hand to helping make the entire offense look balanced as the unit has compiled over 1,800 yards rushing so far. Leading the way is Division I prospect, Cecil Cherry, who plays both ways. Cherry has rushed for 577 yards on 62 carries including five touchdowns. Senior E’Andre Smith, an Alcon State commit, has also proved beneficial to the rushing attack, putting 567 yards on the ground with 47 carries and 10 touchdowns. If two running back aren’t enough, throw in the third one of the group and that would be Jaylyn McKinney, who is a Division I prospect with several offers. McKinney has rushed for 545 yards on 58 carries and has gone into the end zone for touchdowns 7 times. On defense, Victory Christian has proven its weight on that side of the ball. Some familiar names here again have been beneficial to keep things going. Cecil Cherry who also plays from the linebacker position on defense has already been credited with 150 total tackles this season, with nine for being for a loss, plus two sacks. Jaylyn McKinney has 71 tackles total so far, but has been the team leader in sacks with 7 this season that has resulted in a loss of 47 yards total. “Close games always come down to one, two or three plays that you look back on that could change the outcome of a game and I imagine this game will be no different. I think at the end of the day both squads will be able to look back at the game and there will be some key moments that you hope your kids make plays and hope your coaching staff putting them in the right position to make those plays. At this level, state championship level, it always comes down to doing the little things, right each play and whither it is assignments, checks, eye discipline, all those kinds of things is what is going to come down to. And as far as what people actually see, I would say turnovers will play an important role, special teams will play an important role and penalties. Those are the kind of things that end up having an impact.” – Victory Christian Head Coach Tommy Lewis on the impacts of two great teams and what it will come down to, to win the game. Team was already building something special since last season when they reached the state semifinals in Class 2A. Now, the Golden Eagles are coming to the Class 2A State Championship game and it could have been a more interesting journey for this program. Indian Rocks Christian, which won the District 2A-5 championship, faced was Evangelical Christian from Fort Myers in the regional semifinals, running over the Sentinels, 62-14. In the regional finals, the Golden Eagles totally dominated a First Baptist team has risen up the ladder the last few years, winning that game on the road, 48-12. Just last week with another road game again at Glades Day, things were tight until late in the fourth quarter where Indian Rocks Christian pulled out a 40-19 win. The story line this season for Indian Rocks Christian is simply one word: Rushing. That is it rushing. 3,518 yards of rushing to put it down to on 332 carries by the Golden Eagles running backs. In fact, two of the four running backs that Coach Buchanan relies on have combined for over 2,000 yards in rushing alone along with a combined 36 touchdowns. Jacquan Fuller, a senior running back, leads the way with over 1,100 yards with 18 touchdowns on 81 carries. Not far behind Fuller is Zeke McGaughy, a junior running back, has produced over 1,000 yards on the ground with 18 touchdowns on 124 carries. To add more fuel to the fire in the rushing department, junior running back Theo Anderson, has another 778 yards on the ground with 16 touchdowns on 68 carries. Looking at the passing game, you will find that the Golden Eagles have only had 68 attempts with 35 completions from junior quarterback Garrett Ross-Johnson. Ross-Johnson has only thrown for 720 yards and nine touchdowns and 4 interceptions this season. Ross-Johnson’s favorite target is running back Theo Anderson, who has caught eight passes for 251 yards and three touchdowns so far. Shifting over to defense, this is where the numbers get staggering and make you want to say wow. The biggest stat that stands out is sacks made by the Golden Eagles defense. With 60.5 sacks to date on the season, that is very high for almost any team to have. Fisher Jones, a senior defensive lineman, leads the team with 18.5 sacks to date. If you don’t believe the sacks in being part of a key role for the defense, the number of running clocks should help tell the story even further as Indian Rocks Christian has had 10 running clocks in games this season, including during the playoffs. That should be scary enough to think about defensively without diving further into the defensive stats which are just staggering the more you look at them. “Now that Damian King is back, we kind of got a four-headed monster in the backfield. We put in formations through out the year that will get all four of those kids on the field pretty much together. We share the ball around and our kids know that would be the case coming into it and they have actually enjoyed that. They enjoy blocking for each other. They know that on any given night they could be the guy with 100, 200 yards, they know that their teammates may have 100, 200 yards. but they are doing what ever is necessary for the outcome to be a W. It has been pretty cool to watch them being unselfish during through out the year and waiting their turns.” – Indian Rocks Christian Head Coach Mark Buchanan on his team’s rushing attack so far this season. Throw everything out on this one when it comes to experience playing in state championship games. That is not going to matter here. What is going to matter is those few plays that will make or break either teams chances. Victory Christian is overall a very balanced team, but they are going up one of the best defensive units they will likely have seen all season long in Indian Rocks Christian. On the other side, can Victory Christian’s defense put the brakes on Indian Rocks Christian’s rushing attack and make them throw the ball more often? 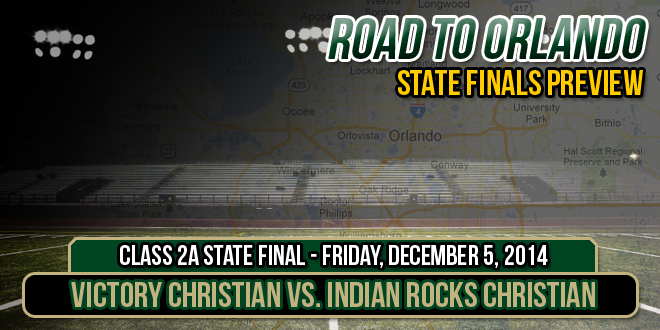 There is a lot of questions here that will play out in the state final, but looking at the rosters, either team can win this one, but we feel Indian Rocks Christian will finally break the Pinellas County drought of never having any team win a state championship and finally bring that trophy back to the county for the first time in 51 seasons of the FHSAA State Series in Football. Our state finals coverage is proudly presented by ScoreStream. If you are going to the game, download the app on your iOS or Android device and share your photos to the rest of the world on just how great Florida high school football is! Visit ScoreStream.com for more details and to download the app.